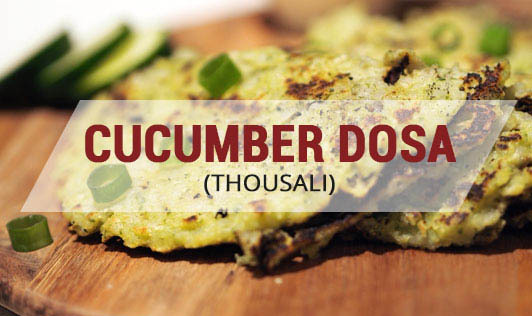 Thousali is a traditional Konkani dish made from cucumber and rice. This can work as a healthy and interesting alternative to the regular dosa. Thoroughly wash, peel, and grate the cucumber. Transfer to a bowl and set aside. Grind the coconut, chilies, and ginger along with ½ cup water to make a coarse paste. Mix grated cucumber, banana, coconut paste, jaggery, and salt in a bowl. Add rawa and mix well to make a dosa batter. Heat a nonstick pan and grease it with some olive oil. Spread some dosa batter and cook on both sides. Serve hot with MTR chutney powder. Note: To make it less calorie-dense, avoid adding coconut and jaggery to it.